Aside from its obvious beauty, living on or by the waterways actually has plenty of health benefits. It has been proven to not only calm the mind, but also combat depression. Previously, the Canal and River Trust published research on how canals are being prescribed by GPs to help battle depression. Even a simple trip on a canal can significantly help people with mental health issues. They are also being used to combat stress – something we all suffer from time to time. Julie Cox, who has lived aboard a boat for over five years, says: “I have met many people on the canal with all sorts of issues, depression being the main one and I think being by the canal does help. This is mostly because no one seems to judge one another and everyone seems to be accepted for the way they are”. Julie chose to move her lifestyle from her house in a quiet village in Wellingborough for the relaxing waterways. She, explains: “The benefits of living on a boat is not feeling so rushed, you’re able to move when you want to and it offers a much healthier lifestyle all round”. With so many canal fronts across the UK, it can provide not only boatowners but homeowners and holiday-goers with that all-important waterfront view. Here are three unique properties that’ll help you make the most of the waterway’s health benefits. Located within a tranquil marina, the floating homes (owned by BWML and currently based in Sawley Marina) are a great alternative to living on a boat. Financing one of these homes is much like financing a lodge or park home, as they are not registered with HM Land Registry as a building, and therefore do not qualify for a mortgage like a traditional house or flat. Jeff Whyatt, Managing Director of BWML, said: “The reaction to the floating homes have been very positive, the units have an outside deck and open window space, which offers excellent views and have really caught people’s imagination”. 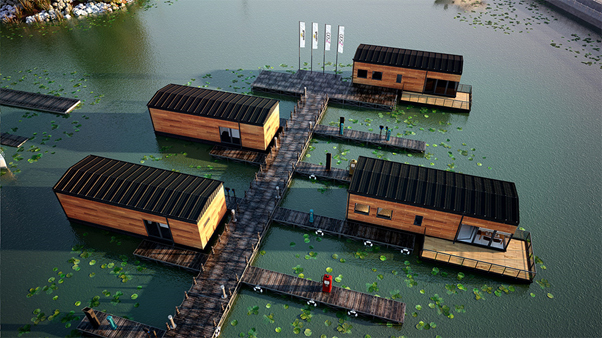 These homes offer a really different lifestyle choice, with the perfect view overlooking the water inside and out. Connecting homeowners to the outside world in a country park setting, it is an ideal location for those who are looking for a tranquil and calming living space. Equally, for homeowners, finding the right location surrounded by gorgeous waterfront views in popular areas, such as Cornwall, would be a fantastic way to buy into those all-important health benefits. As Cornwall cottages have some of the most quirky and amazing waterfront views, it attracts thousands of homeowners and tourists year-on-year. Whether you’re looking to move permanently to a waterfront area or take a relaxing holiday, waterfront cottages could be the ideal living situation for those who are in desperate need to reduce stress. For those who aren’t in the financial position to relocate to the waterfront, booking a holiday by the water the next best thing. Yvonne, who works for an award-winning hotel – Greyhound on The Test Inn, has commented: “Hotel guests come for the beautiful waterfront setting and world-class exceptional fishing”. Activities, such as fishing, also have very similar health benefits as to living by the canal. It promotes relaxation, improves cardiovascular health, teaches self-reliance and many more similar health benefits. Jack Rose, who has been fishing for 15 years and is an expert angler, said: “Going fishing is a great way of getting away from the noise and stresses of my busy life. It’s not all about catching a fish it’s also the time spent beside the water to help me relax”. If you live on a boat, floating home or in house with a waterfront view, we want to hear your thoughts on the health benefits the waterfront gives you. Do you know someone this has helped or do you have a personal experience you are open to sharing?